Stevie Wonder, Donald Fagen, Chick Corea, Scritti Pollitti, Bryan Ferry, Elton John, Joe Zawinul, Aretha Franklin, Joe Sample, Dave Gruisin, Ry Cooder, Al Jarreau, Robbie Robertson, Quincy Jones, Luther Vandross, George Benson, Michael Jackson, Chaka Khan, David Sanborn, Natalie Cole, Boz Scaggs, Herbie Hancock, Miles Davis, and.......well, you get the idea! 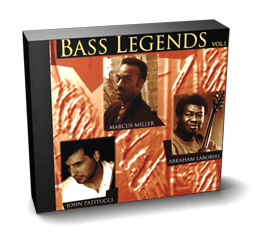 Bass Legends is one of the first sample libraries to offer you both intricately multi-sampled instruments and chromatically sampled grooves and phrases that we call Chromazones™. For bass sequencing applications, the 650 meg CD-ROM collection is recognized worldwide as the most complete and musical Bass Instrument Library on the market. It's no wonder that Bass Legends has become one of the best selling CD-ROMs of all time. The players' instruments cover a tremendous variety of tones, ranging from 4, 5, 6 & 8 string electrics- to Patitucci's Pollman Acoustic, and were all recorded with the finest in vintage tube technology & captured from within a musical context. Bass Legends was produced by L.A. studio synthesist Eric Persing, well-known for his sound design and CD-ROM development for Roland. "...a truckload of great multisampled basses...easily the best acoustic bass I've ever heard on any sample collection ...thoroughly convincing...the velocity switching is superb...really fun to play...the low-end sounds particularly good... the most flexible bass loops I've encountered...This is a great disc... Definitely put this one on your list of must-haves!" "...really two products in one: a collection of bass phrase loops and a library of multisamples matching the tone and style of each loop...Coming from three such magnificently talented, multifaceted players, the phrase loops are naturally superb...styles span a wide range, from funk, rock and reggae, to swing and acid jazz...The documentation is excellent...Although the phrase loops are great, Bass Legends is worth purchasing for the multisamples alone...over 40 different bass sounds, including picked, fingered, slapped, popped, and muted clean electrics; half a dozen fretless basses; a couple of overdrive-colored electrics; and one sterling acoustic bass...Many use velocity-switched layers for greater expressiveness, and some also include extensive samples of special effects, including slides, string hits and scrapes...an ultra-organized labeling system...the combination of memory-usage options with clear, consistent labeling really makes working with the library a pleasure...the best sampled acoustic bass I've ever heard....a totally incredible three-way, velocity-switched funk bass...The samples and programming work together exceptionally well...wonderful fretless basses...cool and fun to play, these sounds are useful in the real world...Bass Legends is a genuinely superb product. The phrase loops are well-organized, exquisitely recorded, and brilliantly performed; the bass multisamples are flawlessly looped, expertly programmed, and lend themselves to expressive playing. I'd encourage anyone to go for the CD-ROM version rather than the audio CD; you don't want to miss out on those multisamples!" "Where does one stop the gushing?...an ELEVEN!"